We already know the story of the theater of Baldracca, but - very close to it - there was another space dedicated to theater, inside the Uffizi Palace. This is the Medici Theatre, built by Bernardo Buontalenti (1531 - 1608) for the Grand Duke Francesco I de\' Medici. Most likely, the court architect worked at the theater between 1576 and 1586. However, already in 1589, by the will of the new Grand Duke Ferdinando I, Buontalenti profoundly modified the theater decorations. Buontalenti is a master of Italian Mannerism, artistically influenced by Michelangelo. The Tribuna of the Uffizi is one of his masterpieces. The architect had worked on a Mannerist and experimental architectural language for this theatre. Ferdinand I, however, wanted a space that would represent his authority: the decorations took on an allegorical character. The room structure was inspired by classical antiquity theaters. However, Buontalenti was also very innovative: the floor of the room was slightly sloping: all the audience could see very well the stage. Many tricks and mechanisms also enlivened the performances. When the court of the Medici moved to Palazzo Pitti and new theaters opened in Florence, the room was abandoned. The theater became the seat of the Senate, during the period in which Florence was the capital of Italy. Today the two floors occupied by the Medici Theatre are separated. The last works date back to the Fifties, when also the architect Michelucci was involved. Downstairs are now the Rooms of the Primitives; in the upper one, the Department of Drawings and Prints. 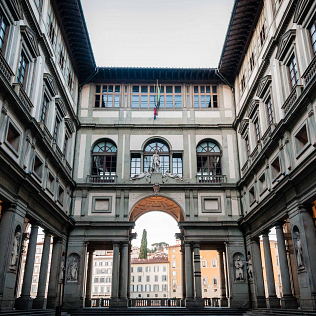 Even today, Uffizi visitors can admire the entrance to the theater built by Buontalenti.